I've recently upgraded my project to Unity 2018.3 and latest version of Playmaker. In most FSMs when I right click on global transition I get this error. Can you click the FSM tab and check the Data Version at the bottom of the inspector? It should say 2 unless it's a very old project. What version of Playmaker and Unity did you update from? Or making any change to the FSM, e.g. moving a state should resave the FSM with the new Data Version. On FSM featured in the video it says Data version 1. But I get this error on FSMs with Data version 2 as well. Does making a manual change to the FSM update it to version 2? 1.8.4 is pretty old and 1.8.5 was a big update, so it might help to update the project to 1.8.5 first then 1.9.0. PM me if you need access to 1.8.5. Also are you able to share the project so I can look at it? PM me a download link if you can share. Also, to double check, are you only seeing this in that project or in new projects also? Also are you able to share the project so I can look at it? No. It's giant. Hundreds of gigabytes. But I can try to make seperate project with part from this project, where this issue will still occur. I did encountered some kind of issue in new empty project. It also appears when I try to create new global variable. When I tried it the second time with new empty project. Everything worked fine. Maybe this issue was caused by Unity 5.6.5 that was opened in background. When I tried it the second time with new empty project. Everything worked fine. Maybe this issue was caused by Unity 5.6.5 that was opened in background. Issue with my big project however remain. I also get Non-negative number required. error when I hit. Refresh used count in this scene. Even in empty scene. Will I'll be able to install it in in Unity 2018.3? Will I'll be able to unsull in in project where 1.9.0 was already installed? Okay. I've made a huge progress. 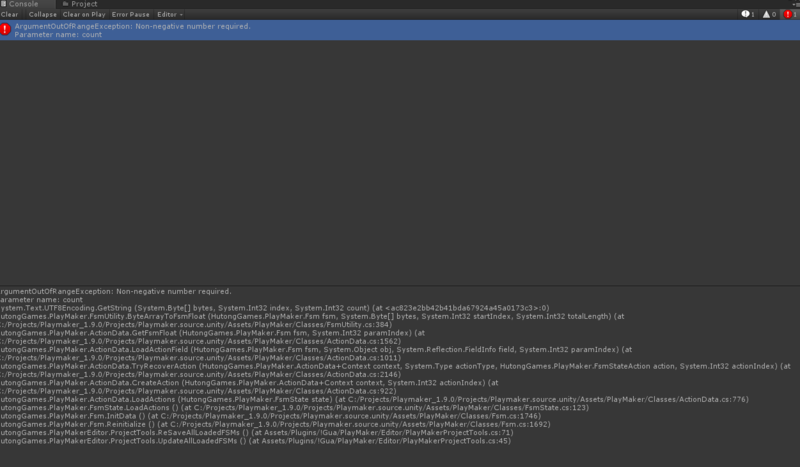 I've completely deleted Playmaker folder and installed Playmaker from the scratch into proper directory (Previously it wasn't in Playmakers default directory) some new errors appeared related to specific actions. When I've solved those errors, I did the test and Non-negative number required number did not pop-up. I'm not yet sure if logic somewhere is now broken. I'll post when I will have more info to share. Unfortunately in the process of this fix, most Run FSM actions lost connections to template. Unfortunately error has returned. Right now my project is at a stage where this error doesn't happen. But as soon as I open Canvas_RFPS prefab, edit fsm in there a save it. This error returns. 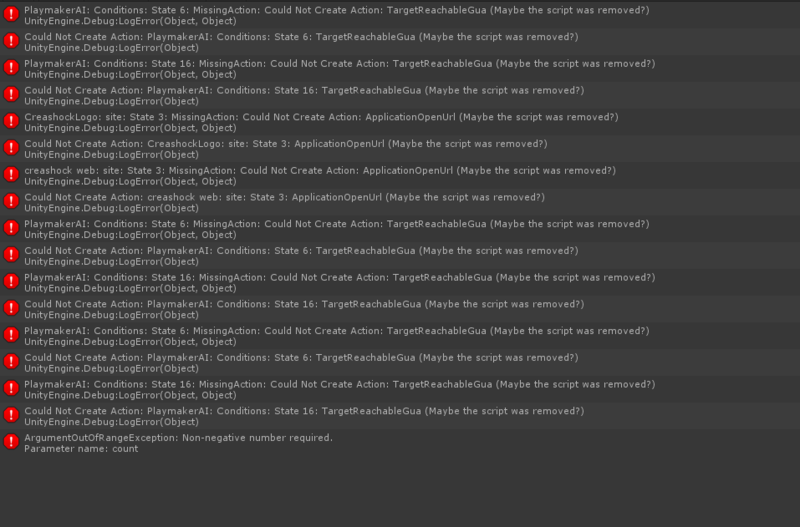 Happens also when I edit other prefabs. I've sent you PM with the link.